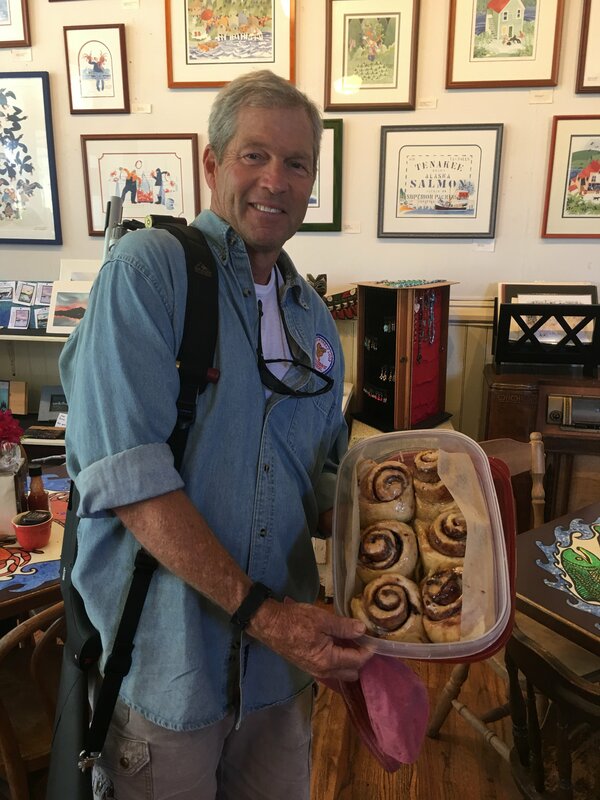 Our departure is delayed today as we can’t pick up our half dozen cinnamon rolls from the Part Time bakery until 8:30 AM. Hot and fresh out of the oven, they are the best cinnamon rolls we have had in a long time. They were well worth waiting for! As we enter Chatham Strait we see another Krogen in the distance. 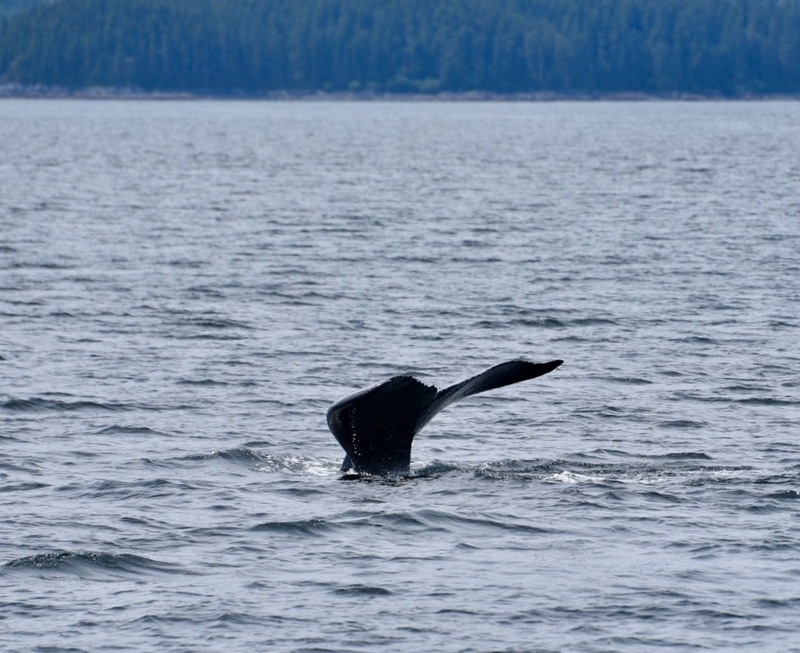 It is Rekindle watching a group of humpbacks out in the sound. By the time we arrive, the whales have moved off in the distance. We have another beautiful cruise down Chatham Strait and are soon turning into Peril Strait. A humpback whale is feeding just in front of the entrance. This section of waterway got its name when a banquet thrown by local Tlingit people for early European fur traders became deadly from a red tide algae bloom in the clam chowder. 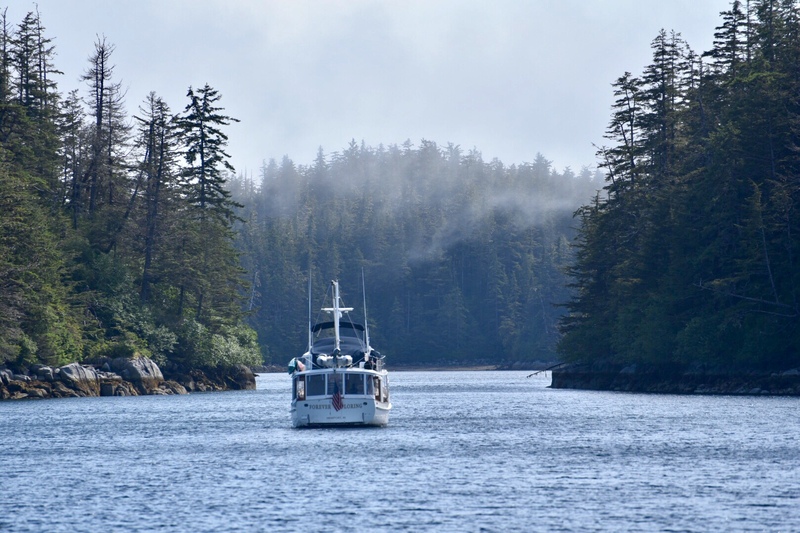 Our anchorage today is in the small bay of Appleton Cove on Baranof Island. Commercial crab season has opened and the crab pots are as thick as fleas in the anchorage. We settle for a spot in the outer part of the harbor away from the multitude of pots. Rekindle and Forever Exploring join us in the anchorage along with three other boats. With three Krogens in the harbor, we have a mini Krogen Rendezvous aboard Forever Exploring. As a surprise, we bring cinnamon rolls for everyone from Tenakee Springs. The eagles are working the harbor this morning as they fly just along the surface dipping their bright yellow feet with massive talons onto unsuspecting fish. There is a mass exodus from the harbor at 7:30 AM as everyone is timing departure so as to arrive at Sergius Narrows thirty miles away at slack tide. Idyll Time follows Rekindle and Forever Exploring. Rekindle has made this trip before so we are happy to let them lead the Krogen fleet today. Currents in Sergius Narrows run up to nine knots. According to our guide book, “Vessels should pass through the Narrows only at or near slack water. At the strength of the current it is not safe for any vessel. The strong currents create standing waves”. We arrive to the Narrows thirty minutes early and see only a few tide rips. After circling several times, we decide to transit early and have only a two knot push and some minor tide rips. Nothing dangerous at all. Reaching Salisbury Sound, we have a brief glimpse of the Pacific Ocean as we cross this open water section. Today the Pacific is calm and treats us kindly with only a slight swell and some patchy fog. We see quite a few commercial fishing boats out trolling for salmon. Our anchorage is Magoun Island in Kerstof Sound. The entrance into the lagoon is a very narrow shallow passage. The entrance is only about 100 feet wide with nine foot depths. This anchorage is not listed in any of our guide books but Rekindle was here several years ago and found plenty of water. They enter first and radio back that the depths were no less than 13 feet so we slowly follow Forever Exploring into our anchorage. There are still many uncharted rocks in these remote areas of Alaska so we always enter new anchorages very slowly and with someone on the bow watching for rocks just below the surface. We soon have the dinghy down in anticipation of fishing around this beautiful anchorage. We spend two days trying for salmon and halibut but none are to be found. We catch quite a few rock fish. We keep four of the largest for dinner but release everything else. 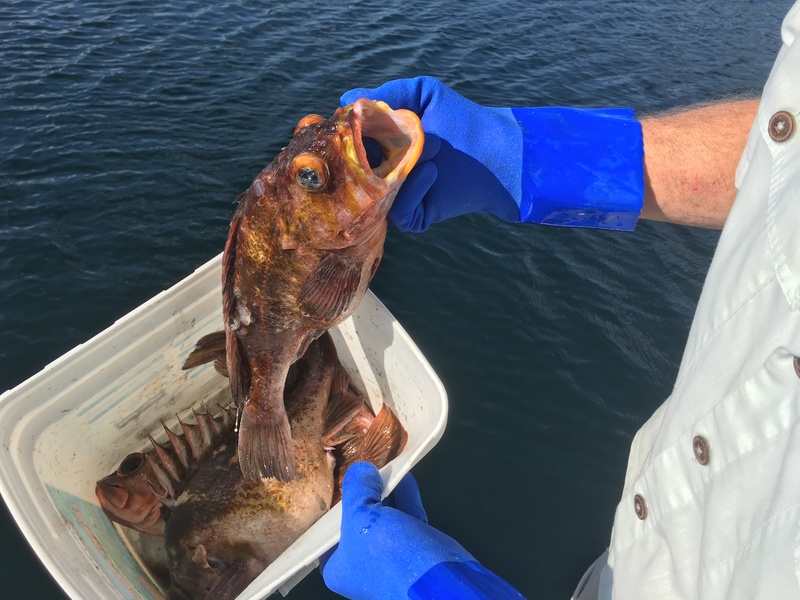 These fish can be up to 75 years old and we notice several that we have caught are females with eggs. We feel it is best to harmlessly release them. Our search for halibut turned out to be quite expensive. Jeff had just deployed his halibut rig and set it in the rod holder when I noticed the rod bending at a severe angle. As he reached for the rod, the rod holder slipped on the rail under quite a bit of tension and the rod and reel suddenly shot out of the holder into the water. We watch in disbelief as our rod and expensive Gold Penn Senator reel slowly disappear into the murky depths of Magoun Cove. We normally have the rod leashes to the rail but for some reason we had neglected to take this safety precaution today. We will never know what kind of fish caused this calamity. Was it a 100 pound halibut or were we hooked to a rock on the bottom. The thought of a big halibut makes for a much better ending to this sad experience. I guess we will be purchasing a new rod and reel tomorrow when we head into Sitka. After saying goodby to Amy and Jim on Rekindle, we depart Magoun Island at high tide with plenty of water at the entrance. There is some patchy fog out in Krestof Sound but as we near Sitka the fog lifts. With only a slight swell from the Pacific, we have a beautiful day on the water. It is a short day of only 14 miles to the Sitka harbor. 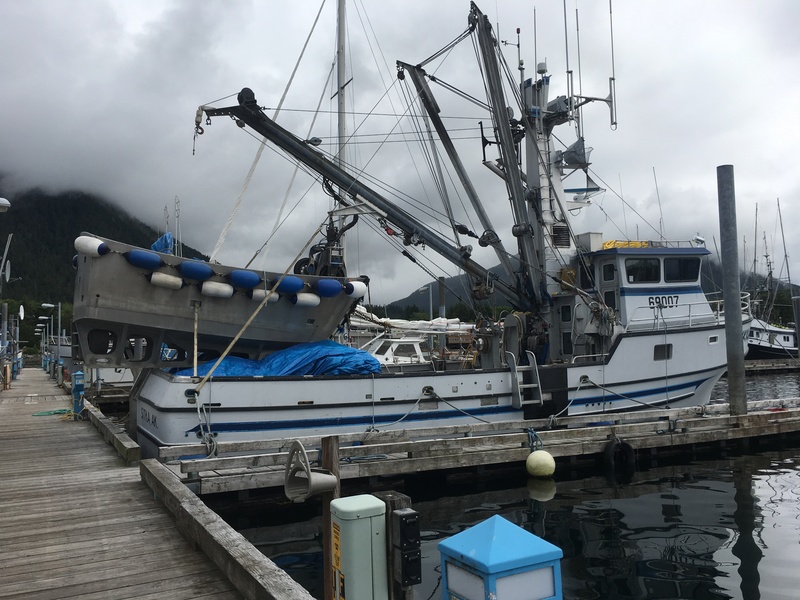 Sitka has a hugh marina with over 350 slips. It is primarily a fishing town and the fishing boats are starting to head out for the beginning of salmon fishing season. We are soon assigned a berth in Eliason Basin nestled amongst the fishing fleet. In Alaska it is called “hot berthing”. You are given a temporary stall that belongs to one of the commercial fishing boats. If that owner comes back in we will be required to move to another slip. Two other Krogens are in the harbor, Spirit Journey and Rob n Lee. 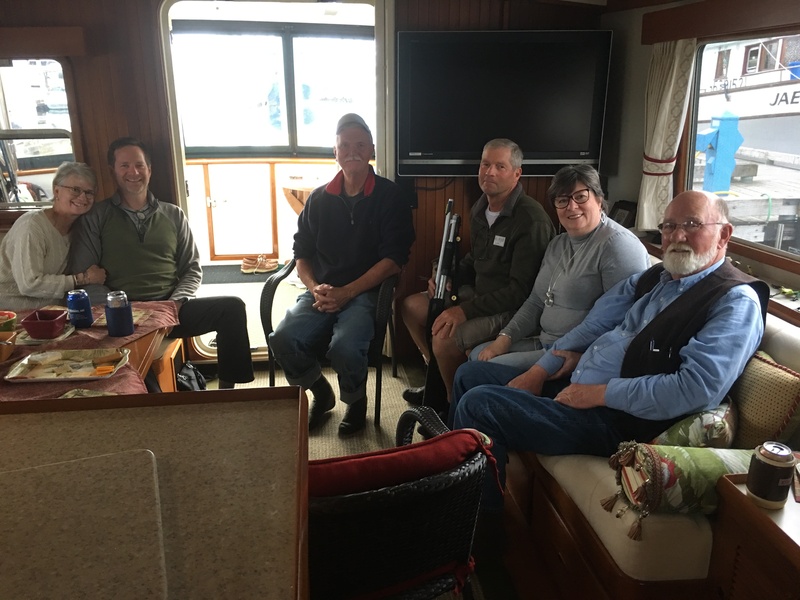 Ron and Michael on Spirit Journey shipped their boat from the east coast two years ago and overwintered their boat last year in Wrangell. They have provided us with tons of helpful cruising info in this area. We are excited to finally meet these two adventurous people. Ron tows a small aluminum fishing boat and we join him one morning for a few hours of salmon fishing. The day before Ron had caught a beautiful King and our hopes are high. But alas, we are not as fortunate today. Wendy and Leigh on Forever Exploring also arrive in Sitka and are assigned a stall next to Spirit Journey. With four Krogens in the harbor, we hold a mini Krogen Rendezvous aboard Idyll Time. Sitka is the Tlingit word for “by the sea” and is a town rich in Native American culture and Russian history. 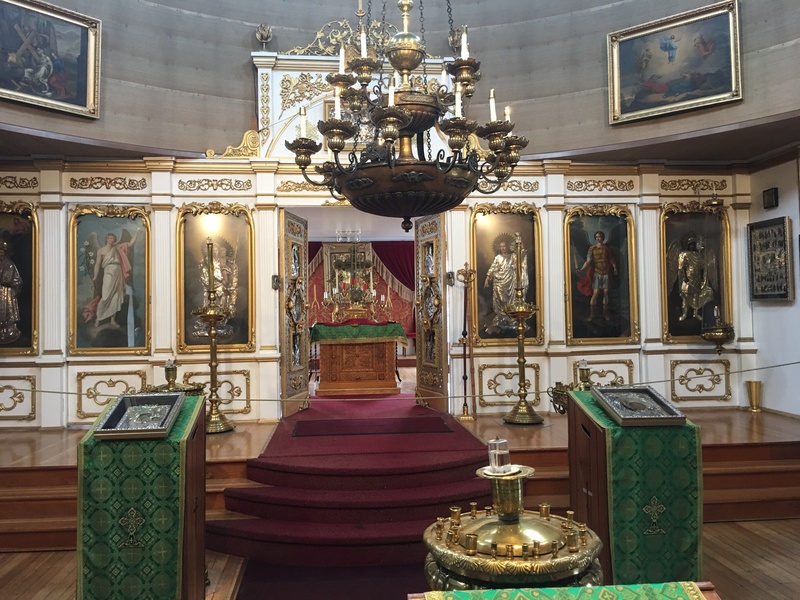 We spend a day as tourists exploring the Russian Bishops House, Totem Trail Park, and St. Michaels Russian Orthodox Church. 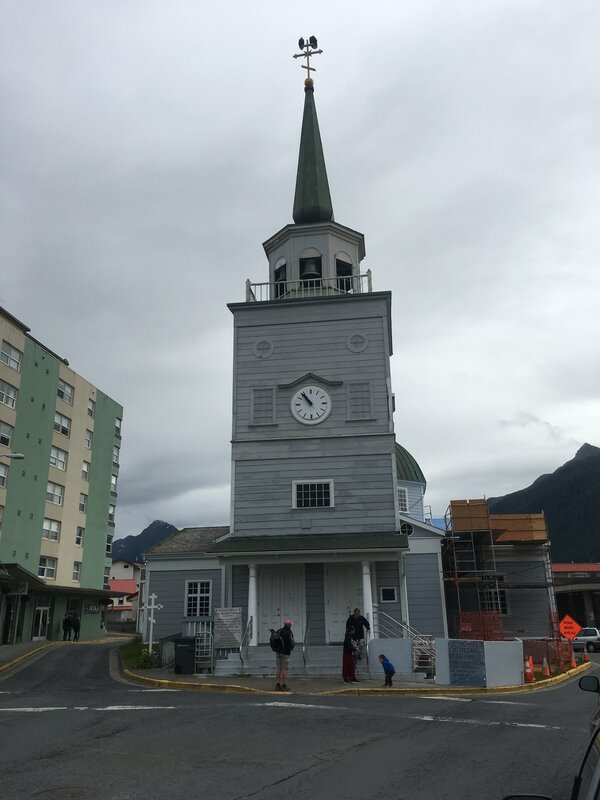 As fur trading diminished, the Russians left Alaska but the Church continued to play an important role in Sitka history. 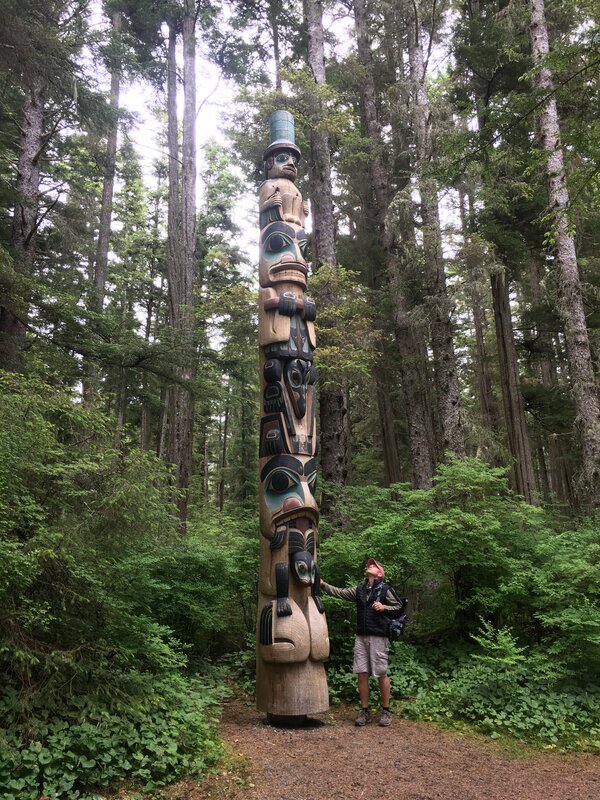 In Totem Trail Park we hiked the loop trail through a temperate rain forest where we found a wonderful collection of totem poles carved by the Tlingit. This trail eventually brought us to the Raptor Rehab Center. 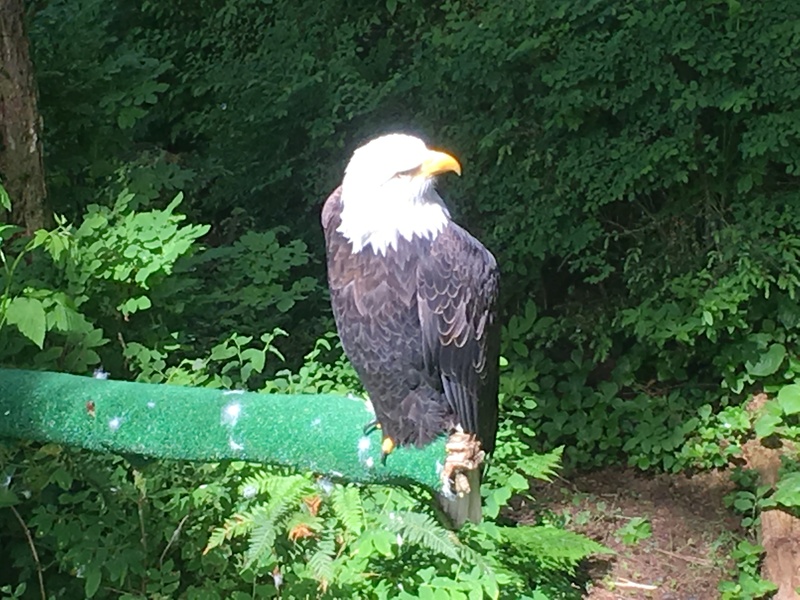 We enjoyed some close up views of Eagles, hawks, and owls. Many of these birds having been injured, are being rehabbed for their eventual release back into the wild. Our last stop of the day was to the Fortress of the Bear. This safe haven for orphaned Black and Grizzly Bears utilizes old pulp mil settling tanks to provide a rich environment for these bears. Were it not for this facility, these bears would have been killed as the state of Alaska does not have a rehabilitation program. 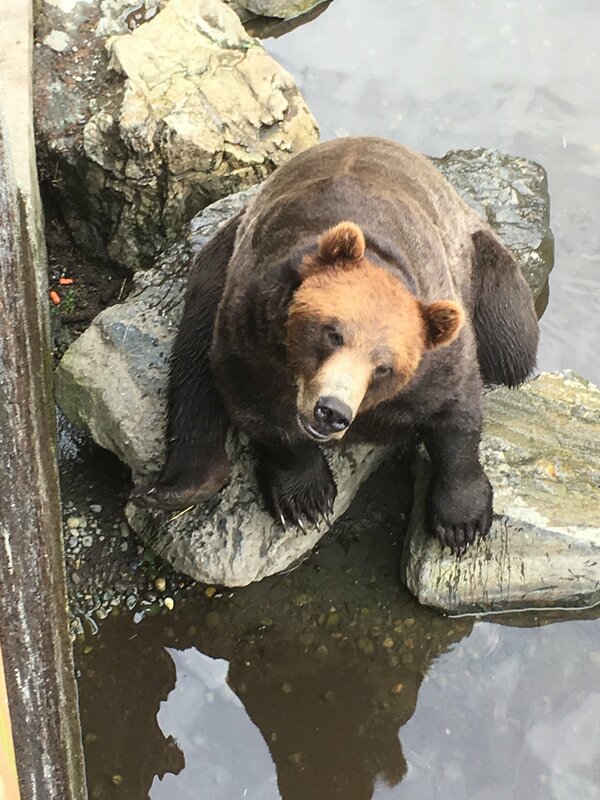 We enjoy watching a fifteen hundred pound male grizzle munch a whole Coho salmon like a snack bar. 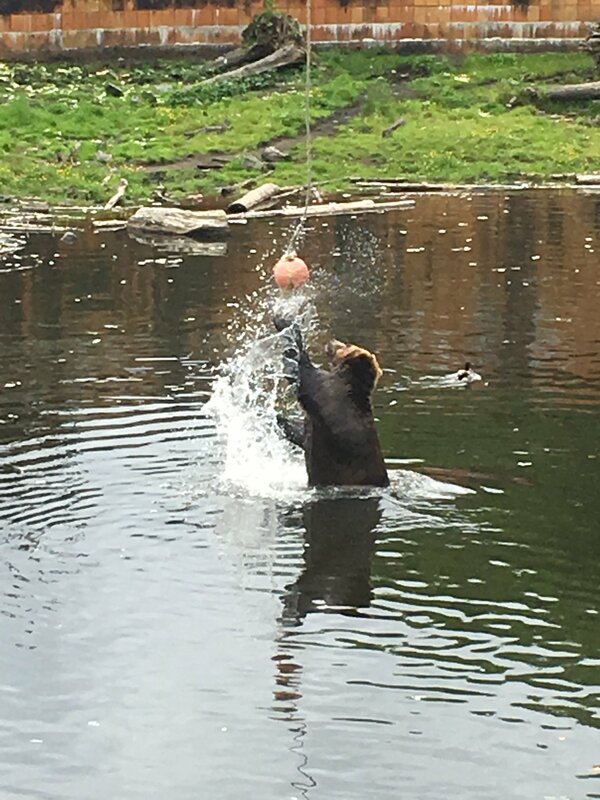 Another large male is occupied swatting a tethered ball above a deep pool that drops dog kibbles into the water when struck. With many hiking trails there is lots more one could explore in Sitka. We hope to return in future years to enjoy more of what this wonderful area has to offer. Tomorrow we begin the journey to Hoonah. This entry was posted on July 20, 2018 at 12:43 am. You can follow any responses to this entry through the RSS 2.0 feed. You can leave a response, or trackback from your own site.